Islamic-Waves.com: Orya Maqbool Jan : Jab Jahangir Badar Marhoom Ki Namaz-e-Janazah Ke Liye Maulana Tariq Jameel Sb Ka Naam Pukara Gaya! 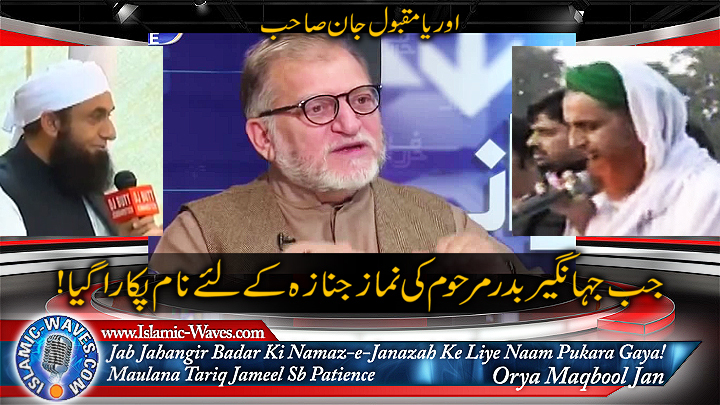 Orya Maqbool Jan : Jab Jahangir Badar Marhoom Ki Namaz-e-Janazah Ke Liye Maulana Tariq Jameel Sb Ka Naam Pukara Gaya! Orya Maqbool Jan Saheb exposing real inside story of the event of Namaz-e-Janazah of PPP Leader Jahangir Badar Marhoom, he told when Maulana Tariq Jameel Saheb's name was called for leading the funeral, some green turban people came out immediately and start the funeral prayers, Maulana Tariq Jameel Sb demonstrate marvelous example of patience and stood back and offered the prayers quitely.